G2H2 members’ blogs are meant to inform and inspire and perhaps promote debate or joint action; they do not represent a consolidated view of the G2H2. To post a blog, please get in touch with the G2H2 Secretariat. For blogs not yet published elsewhere, an informal peer review is strongly recommended. For comments, please use the form on the bottom of the page. Comments will be moderated. WHO walks a very cautious line about the health of refugees and migrants in the WHO European Region (WHO EURO). The health argument should have been used more courageously to take a stand against discriminatory policies and convince even the most reluctant policymakers about one irrefutable reality : refugees and migrants, like European residents, are human beings. Surely, the topic of human mobility has been the stumbling block in the common agenda of European countries for the last few years. In fact, the very existence of the European Union as we have known it so far is at stake, on this political issue. A certain degree of prudence would seem understandable, then, a few months ahead of the May EU elections. Surely, the intergovernmental nature of the UN agencies force them to interact with Member States, that is why exacerbating the political arena is a risky operation that may not pay off at all, in the long run. Moreover, for WHO EURO, the report on the health of refugees and migrant people in the 53 countries of the region is the first one of its kind, which may explain the hesitance of the beginner. But it is difficult to deny a bitter aftertaste, especially after the press conference. 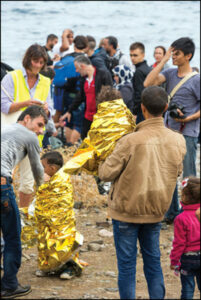 The first Report on the health of refugees and migrants in the WHO European Region, launched in Geneva ahead of the WHO 144th Executive Board, is a review of existing literature and therefore basically illustrates the main pieces of evidence. Let me frankly say that it comes with remarkable delay, considering the decades long history of migrations in Europe. Only in 2016 did the WHO EURO Member States adopt a European strategy on health and migrations, and in 2017 a priority action plan. This delay bears undeniable political weight, if one is to consider the immense cultural and political regression that has calcified in national policies in Europe, meanwhile. But it could at least have been compensated in the report with stronger political analysis and recommendations, within the cogent framework of health. After all health, better than any other reasoning, could convince even the most reluctant policymakers about the irrefutable (and often denied) reality that refugees and migrants, like European resident, are human beings. Bodies function in the same way, so that the health of the ones is a guarantee for the health of the others. What does the report say in this regard? The 53 countries of the WHO EURO Region embrace a population of 920 million people, 10% of which (90.7 million) are international migrants. Mostly, migrants arrived in Europe in the last decades as labour force (Russia alone harbours around 50 million labour migrants, who moved from the former USSR countries). It is the aspiration for a better life that induces people to leave their homes. But also violence, conflicts, natural disasters, widespread human rights violations force millions of people to abandon their countries and undertake often hostile migration routes. They account for 35% of the global international migrant population, out of the 258 million people who, according to the 2017 UN estimates, live outside their country of origin. The proportion of migrants and refugees living in the European region varies from the 50% in Monaco and Andorra, to less than 2% in Albania, Bosnia Herzegovina, Poland and Romania. Less than 7.4% are refugees. However, in several European countries, citizens estimate that there are 3 or 4 times more migrants than there really are. Exotic or other communicable diseases are commonly associated with displacement and migration, but this is hardly the case. So, just to clarify things, the sad reality of Europe being the only WHO region where the spread of HIV/AIDS is increasing is not due to the presence of refugees and migrants. Rather, to the total lack of appropriate prevention measures in Eastern European countries, alongside the lack of guidelines and other HIV/AIDS related control policies. Refugees and migrants do certainly happen to be more exposed to the risk of developing infectious diseases, but this is because of their exposure to infections, lack of access to health care, interrupted care and very harsh living conditions during the migration route. Often, it is the very situation of marginalization and exploitation they experience in the host nations in Europe to determine such diseases as tuberculosis for example, generally well managed in the WHO EURO countries. Figures lead to growing awareness that a range of acute and chronic conditions require specific attention for people moving – in the case of men for example, precarious work-related accidents. Refugees and migrants have a higher incidence, prevalence and mortality rate for diabetes than the host population, with higher rates in women. Refugees and migrants are at lower risk for all forms of cancer, except cervical cancer in women. However, cancer in refugees and migrants is more likely to be detected and diagnosed at an advanced stage, which can lead to considerably worse health outcomes than those of the host population. An important chapter concerns immunization. People arriving in Europe may not have a complete coverage. That is why the immediate uptake by the health system of the host country is key, with a basic vaccination programme, not only for children. Access to health and social services in the receiving countries, it must be repeated again and again to policymakers in Europe who have not understood the notions of universalism and the right to health yet, is a fundamental condition for human security in the host societies. The same applies for mental health: refuges and migrants reach out to Europe with their intolerable burdens of fears and violence, before and during the trip. Depression and anxiety are frequent conditions they have to face, alongside neglected conditions of post-traumatic stress disorders (PTSD). Normative restrictions against migrants and refugees in Europe only exacerbate the scenario of life uncertainty and the risk of exploitation to which these people – women and children particularly – are likely to be forced in civilized Europe. Obviously, the WHO walks the line of extreme caution. ZsuZsanna Jakab, WHO EURO Regional Director, acknowledges governments’ lack of preparation in tackling the inflow of people in the last few years, but does not formulate any criticism with regard to the national migration policies that are increasingly bound to harm refugees and migrants’ health. Nor does she recall the fact that inflows of migrants have sensibly diminished. She only makes reference to the “reluctance ” of some countries to understand the stakes, but she fails to address the health irrelevance of the persisting semantic disquisition on distinguishing between “economic migrants”, “refugees”, “clandestine migrants”, “illegal refugees”, or “vacational refugees”, according to the geopolitical sub-culture of the Italian interior minister. Not a word is said for example about the Dublin Convention regulating the management of asylum seekers in Europe: today, one of the most ferocious policy tools used to paralyze people’s migration projects and a key political determinant of refugee and migrants’ ill health status across their lifetime in Europe. Indeed, also, a major political determinant of the xenophobic disease spreading among residents in the European continent. One epidemic trend that WHO EURO should definitely consider addressing for a next report.